3 Which Value Types can use which Convert Types? Right-clicking on a value in the Parameters Panel brings up a context menu which has a sub-menu called "Convert". The "Convert" menu allows you to specify that the parameter should be controlled automatically in various ways or used in mathematical formulas. Depending on the type of the parameter the Convert menu will contain different options. To convert the parameter back to its original type, select "Disconnect" from its context menu. You can have a look to the Parabolic Shot tutorial for a "real life" use of the Convert feature. When a parameter is animated it is (internally) converted to Animated Value node. Converting to another Convert Types replaces the link. The "Add" conversion can be used with parameters of type angle, color, gradient, integer, real, time, and vector. The resulting value is true only if both Link1 and Link2 are true. The resulting value a string containing the value of "Angle" (in degrees) formatted as a string with a minimum width "Width", with "Precision" decimal places. If "Zero Padded" is true, it will be left-padded with 0 characters. ie. atan(y/x) but without an error when x is 0. The value is the angle between the x axis and the vector (x,y). Converting a list parameter to "Spline" doesn't seem to change anything. Perhaps that's the default type for lists of vertices, such as are found in outlines and regions? The valuenode compares "LHS" and "RHS". The three boolean values determine which comparison returns true. For example, if LHS>RHS and "Greater than" is checked, the valuenode will evaluate to true. The resulting value is a Spline Point, Color, Segment, or Vector made by combining the component parts. The "Transformation" parameter of a Group Layer and Switch Group Layer is a composite parameter, it hold an Offset, Rotation, Skew and Scale subparameter for the group. real "Interval" : Size of the interval to calculate the finite differences (Real >0). (where alpha is the angle between "LHS" and "RHS"). This ValueNode type is only used by the Duplicate Layer. It never appears in the "Convert" menu. It is used to control the range of the Index in the Duplicate Layer (q.v.). The value of the ValueNode varies from the value of "From" to the value of "To" in steps of size "Step". The sign of "Step" is ignored. If From<To the steps are positive, else they're negative. Allows to link two vectors with a dynamic link. The ValueNode (vector type) that is converted to "Dynamic" will be linked to another vector value using a linear/rotational spring system with damping and friction. vector "Tip Static" This is the equilibrium position of the system without external forces relative to the Origin. See Origin. Since it is a vector its length is used for the linear spring equilibrium length and its angle form the x axis is used for the torsion spring equilibrium angle. The initial value of this subparameter is the current value of the Value that is being converted to Dynamic. vector "Origin" This is the basement of the dynamic system. Defaults to (0.0, 0.0). If the user changes this value the final equilibrium calculated position of the value is modified too. 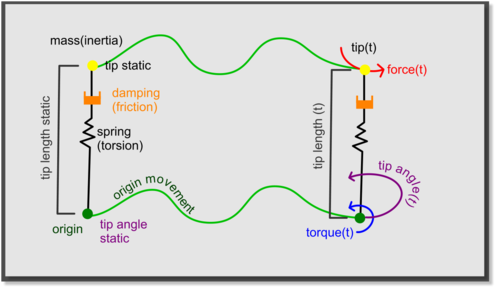 Accelerations of the Origin are used to move the Tip due to the fictitious forces needed to apply under non inertial reference systems. vector "Force" External force applied on the Tip of the dynamic system. Defaults to (0.0, 0.0). real "Torque" External momentum applied tot he dynamic system at the Origin. Defaults to 0.0. The movement of the Origin produces two effects. It drags the resulting vector the same amount of the Origin along the time (that is the resulting vector is the sum of the Origin(t) + dynamic tip(t)) and its acceleration produces an inertial force contrary to the acceleration direction and magnitude. The Torque only affects the angle of the resulting vector respect to the Origin. This means that the mass center of gravity is located at the origin (where the torque is applied) and so there is not centrifugal effects. Since the Origin only can be translated and not rotated, there are not Coriolis forces. If Mass (Inertia) reaches near to zero, then the movement for linear (rotational) link is disabled. Origin is automatically connected to a subparameter of an internal Value Node in order to calculate the second derivative of the Origin (that is the acceleration of the Origin). Do not Disconnect Origin value node. Export it instead and link or connect other Value Nodes to the exported. Converting a list parameter to "Dynamic List" seems to replace each of the "Vertex NNN" sub-parameters with "Item NNN" parameters which can't be expanded, but can be Exported. This is useful for tracking layers which have been zoomed, since the Zoom Layer scales by e^(zoom factor). See this video for an example of the use of this convert type. This is currently disabled. It converts an integer to one of several types. The resulting value is a color taken from the Gradient Tool at the given index position. "Index" 0 corresponds to the left of the "Gradient"; "Index" 1 corresponds to the right of the "Gradient". The resulting value is a gradient based on the "Gradient" parameter, but shifted left (for negative values) or right, according to the value of the "Offset" parameter. An offset of 1.0 will shift the gradient by its entire visible width. Values shifted off the left or right edge aren't lost - they aren't visible in the gradient as it's displayed in the parameters dialog, but they will still be used when rendering (depending on parameters such as "Loop" and "Zigzag", which can cause gradients to be looped between their their left and right edges, rather than using the non-displayed parts). The resulting value a string containing "Int" formatted as a string with a minimum width "Width". If "Zero Padded" is true, it will be left-padded with "0" characters. The result is a string containing the value of "Before", followed by all the strings in the "Strings" list, with the value of "Separator" between each pair, followed by the value of "After". The parameter's value will change linearly over time, starting with the value specified by "Offset" at time zero, and increasing by the value specified by "Rate" (or "Slope", in the case of vector parameters) every second. The "Epsilon" and "Infinite" parameters are only needed to prevent logarithm of negative or zero numbers. For regular operation the resulting value is simply the natural logarithm of "Link". In fact a logarithm of a negative number cannot be calculated in the space of Real numbers. This convert type returns -Infinite for simplicity. The resulting value is the opposite of "Link". The resulting value is true if either "Link1", "Link2", or both are true. The "Epsilon" and "Infinite" parameters are only needed to prevent division by zero. It operates on every type I could figure out how to reverse: lists, strings, spline points and segments, gradients, width points, and dash items. From the Parameters Panel, select what you want to reverse, right click and select "Convert → Reverse"
When reversing a list, it also reverses the individual elements of that list, meaning that, for instance, a spline will look exactly the same after being reversed. For color parameters, the resulting value is the color with the given "Luma", "Saturation", "Hue", and "Alpha" amounts. For vector parameters, the resulting value is the point reached by traveling a distance "Radius" from the origin, in the distance given by the angle "Theta". "Random" can be used on angles, colors, integers, reals, times, and vectors. "Link" provides the central value. "Radius" defines the maximum random difference. "Loop Time" makes the random value repeat after the given time. The value ends up the same at the given time as at time=0 so it's possible to make random looping animations without a nasty jump when the time wraps back to zero. The "Interpolation" sub-parameter should really be a drop-down menu, rather than an integer field, but that isn't yet implemented. "Range" can be used on angles, integers, reals, and times. It is used to limit the value of the linked parameter to be between "Min" and "Max". The result is a string formatted to contain the given value "Real". "Width" specifies the minimum field width, "Precision" specifies the number of decimal places and "Zero Padded" specifies whether to pad with zeros on the left hand side. (6 characters long, 2 decimal places, and padded with zeros on the left). The "Epsilon" and "Infinite" parameters are only needed to prevent division by zero. For regular operation the resulting value is simply the reciprocal of "Link". Converting a parameter to "Reference" adds a single sub-parameter called "Link". The "Link" parameter is the same type as the parameter being converted. It doesn't seem to do anything at all, other than adding an extra parameter. Whatever value is put into "Link" becomes the value of the parameter being converted. The resulting value is a gradient containing "Count" equally spaced, equally wide copies of "Gradient". Each copy has "Gradient" going forwards and then backwards. "Width" specifies relative width of the forward copy, with a width of 0 or less meaning only the backward copy is used, and a width of 1 or more meaning only the forward copy is used. A value of 0.5 will result in the forward and reverse copies of "Gradient" being the same width. If "Specify Start" is checked then "Start Color" will be inserted at the beginning of the new gradient, otherwise the beginning of "Gradient" will be used as the beginning of the new gradient. If "Specify End" is checked then "End Color" will be appended to the end of the new gradient, otherwise the end of "Gradient" will be used as the end of the new gradient. Converting a Spline Point parameter to "Reverse Tangent" adds two sub-parameters: one called "Reference" of type Spline Point, and a boolean parameter called "Reverse". "Reverse Tangent" can only be used on Spline Points. The resulting value is the same as the "Reference" Spline Point, but with its tangents switched over. This is useful when attempting to link the vertices of a region to the vertices of an outline when the region and the outline were drawn in opposite directions, and so tangent1 of an outline vertex needs to be linked to tangent2 of the region vertex, and vice versa. Converting a parameter to "Scale" adds two sub-parameters: one called "Link", of the same type as the parameter itself, and a real-valued parameter called "Scalar". "Scale" can be used on angles, colors, integers, reals, times, and vectors. "Amount" is a number between 0 and 1, defining the distance along the given "Segment". The resulting value for the whole parameter is the tangent to the segment, at the given point along the segment. "Amount" is a number between 0 and 1, defining the distance along the given "Segment". The resulting value is the vertex at the given point along the segment. "Amount" is a number between 0 and 1, defining the distance along the given spline. The resulting value for the whole parameter is the tangent to the spline, at the given point along the spline, optionally rotated and scaled according to the "Offset", "Scale", and "Fixed Length" parameters. "Offset" is an angle used to give the tangent an extra rotation before returning it. If "Fixed Length" is true, the tangent is then scaled to have a length equal to "Scale". Otherwise the tangent is multiplied by "Scale". If a vector was converted the result is the tangent itself. If an angle was converted, the result is the angle of the tangent to the horizontal, and if a real was converted, the result is the length of the tangent. This tutorial gives an example of the use of this convert type. "Amount" is a number between 0 and 1, defining the distance along the given spline. The resulting value for the whole parameter is a vector giving the position of the given point along the spline. "Amount" is a number between 0 and 1, defining the distance along the given spline. The resulting value for the whole parameter is the width of the spline at the given point along it, multiplied by the "Scale" parameter. The parameter's value will change in steps. Each step is "Duration" seconds long. The steps start at times "Start Time", "Start Time"+"Duration", etc. The value of the valuenode is the value of "Link" at some time. "Intersection" determines which time is used. An "Intersection" of 0.0 means that the value of "Link" at the start of the step should be used. An "Intersection" of 0.5 (the default) means to use the value of "Link" at the middle of the step, etc. "Link" is a sine wave. "Duration" is 10f (the frame rate is 24 fps). "Start Time" is 1s. So one step starts at 1s, and others start at 0s 14f, 0s 4f, 1s 10f, etc. 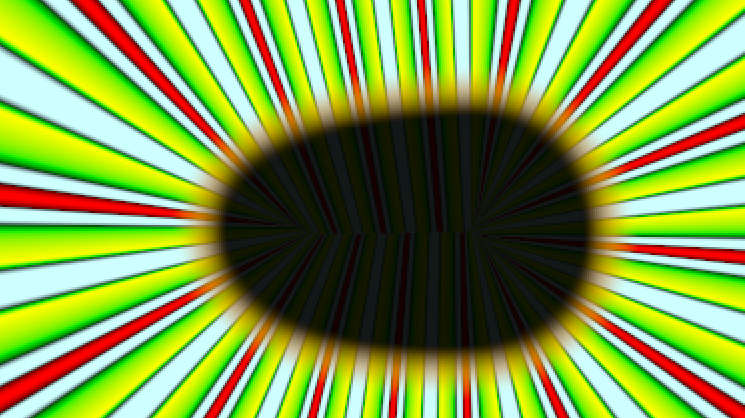 And this is the effect of the Step valuenode on it, with an "Intersection" of 0.0. Notice that at time 0s, the step has a negative value -- that step runs from -6f to 4f, and so its value is the value of "Link" at time -6f. These images were created in The Gimp - it's not currently possible to view two curves at the same time in Synfig Studio. The resulting value is a gradient containing "Stripe Count" equally spaced, equally wide stripes of color "Color 2" with a background of "Color 1". "Width" specifies the width of the stripes, with a "Width" of 0 or less meaning they are invisible, and a "Width" of 1 or more meaning the whole gradient is of "Color 2". The "Subtract" conversion can be used with parameters of type angle, color, gradient, integer, real, time, and vector. "Link Off" and "Link On" are the same type as the parameter being converted. The resulting value is the value of "Link Off" when "Switch" is off, and "Link On" when "Switch" is on. This conversion can be used on all value types. It works similarly to the Time Loop Layer but affects only a single parameter. For any integer value n, from "Local Time + abs(Duration)*n" to "Local Time + abs(Duration)*(n+1)", the resulting value of the parameter is the same as that of the "Link" parameter from "Link Time" to "Link Time + Duration". In other words, "Duration" seconds of values of the parameter "Link" starting from time "Link Time" onwards are looped over and over, with the value of the "Link" parameter at time "Link Time" corresponding to the resulting value at time "Local Time". As an example, suppose the "Link" parameter has a value of time the current time. At 0s the value is 0, at 10s the value is 20. If "Duration" is zero, the resulting value is whatever the value of the "Link" parameter is at time "Link Time". The result is a string containing the given "Time". "Before" and "After" are the same type as the parameter being converted. This conversion type linearly switches from "Before" to "After", taking "Lenght" seconds to do so, and completing the swap at "Time". Note that this doesn't give us anything that we can't achieve using the "Linear" conversion type and a few waypoints. "Timed Swap" can be used on angles, colors, integers, reals, times, and vectors. if "current time" > "swap Time" then "After"
else if "current time" < ("swap Time" - "Lenght") then "Before"
else interpolate between "Before" and "After"
See Slideshow Tutorial for an example. The resulting gradient has two Color Stop, one at each end, starting with "Color1" and ending with "Color2". These color parameters can be animated, giving us the ability to have the gradient change color over time. It used to be used as a workaround for this bug. The resulting value is the angle between the "Vector" and the X axis. The resulting value is the length of the "Vector". The resulting value is the X component of the "Vector". The resulting value is the Y component of the "Vector". Which Value Types can use which Convert Types? Angle parameters can be converted to Add, aTan2, Spline Tangent, Dot Product, Linear, Random, Range, Scale, Step, Subtract, Switch, Time Loop, Timed Swap, Vector Angle, and Reference types. Bool parameters can only be converted to the And, Greyed, Or, Not, Compare Random, Switch, Time Loop,and Reference types. Canvas parameters can be converted to the Switch, Time Loop, and Reference type. Color parameters can be converted to Add, Composite, Gradient Color, Linear, Radial Composite, Random, Scale, Step, Subtract, Switch, Time Loop, Timed Swap, and Reference types. Gradient parameters can be converted to Add, Gradient Rotate, Repeat Gradient, Stripes, Subtract, Switch, Time Loop, Two-Tone, and Reference types. Integer parameters can be converted to Add, Linear, Random, Range, Scale, Step, Subtract, Switch, Time Loop, Timed Swap, and Reference types. List parameters can be converted to Spline, Dynamic List, Switch, Time Loop, and Reference types. Real parameters can be converted to Add, Spline Width, Cos, Dot Product, Exponential, Linear, Logarithm, Power, Random, Range, Reciprocal, Scale, Sine, Step, Subtract, Switch, Time Loop, Timed Swap, Vector Length, Vector X, Vector Y, and Reference types. Segment parameters can be converted to the Composite, Switch, Time Loop, and Reference types. Spline Point parameters can be converted to Composite, Reverse Tangent, Switch, Time Loop, and Reference types. String parameters can be converted to the Angle String, Int String, Joined List, Real String, Switch, Time Loop, Time String, and Reference types. Time parameters can be converted to the Add, Linear, Random, Range, Scale, Step, Subtract, Switch, Time Loop, Timed Swap, and Reference types. Vector parameters can be converted to Add, Spline Tangent, Spline Vertex, Composite, Linear, Radial Composite, Random, Scale, Segment Tangent, Segment Vertex, Step, Subtract, Switch, Time Loop, Timed Swap, and Reference types. This page was last modified on 13 September 2016, at 15:52.